There's a new release available at Catherine Pooler Designs! 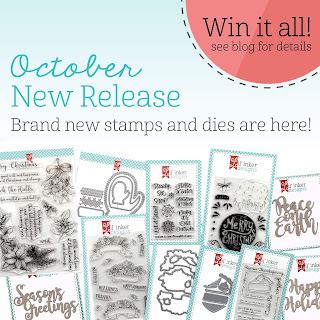 If you remember the Winterhaven Stamp of Approval collection from last year, it is now available in the store! 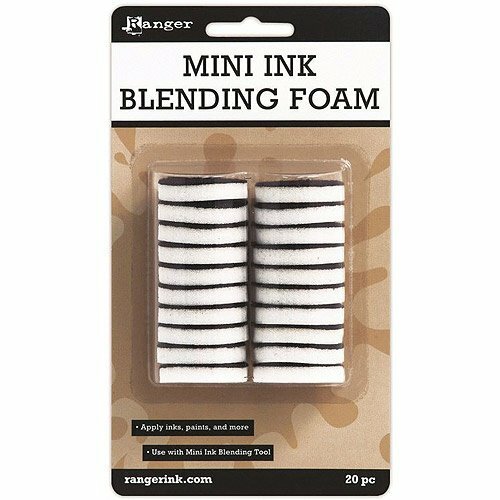 For my card today I mixed several of the Winterhaven items with a few of the products that were released earlier this month. When I first saw the Snow Globe dies I knew that they would pair nicely with the Winterhaven die set and that I wanted to make a card using both. 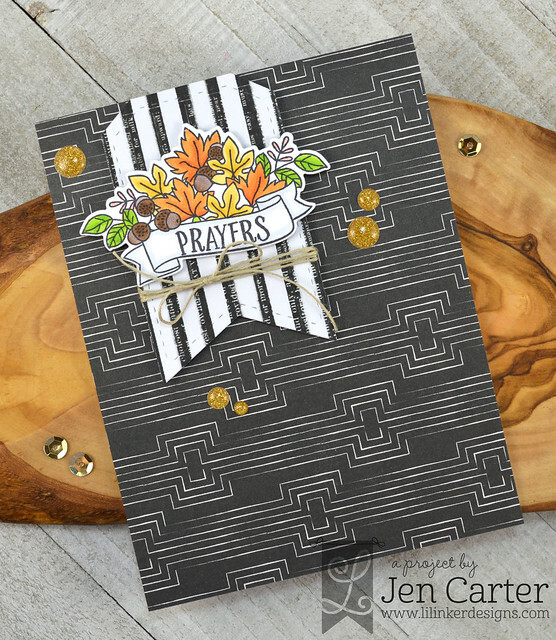 My background is stamped with VersaMark on to Smoke & Mirrors cardstock using the Plaid Background stamp. I next created my globe. I didn't make this one into a shaker, but did add dimension by building up the hills. I die cut the snowy hills, the trees & the buildings using the Winterhaven die set. For the night sky I die cut the largest circle from the Snow Globe dies and then used the star cluster stamp from the Here We Come A-Caroling stamp set and embossed the images in white after stamping the images repeatedly. I used the smallest circle die from the Sugar Cookies die set to create the moon and then used a glitter pen to add a fine shimmer over the moon. The white globe outline & the base were die cut with the Snow Globe dies as well. 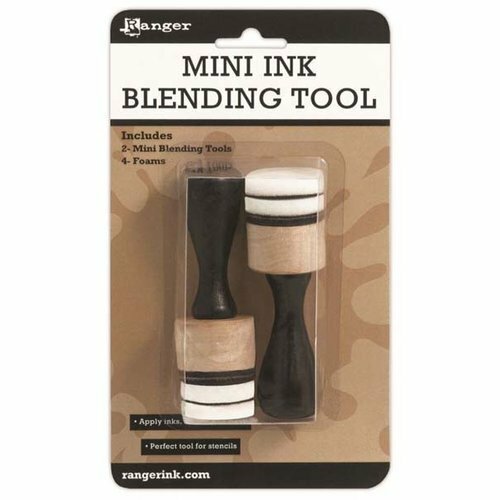 The little label on the base was stamped with the Good Stuff stamp set and embossed in gold. 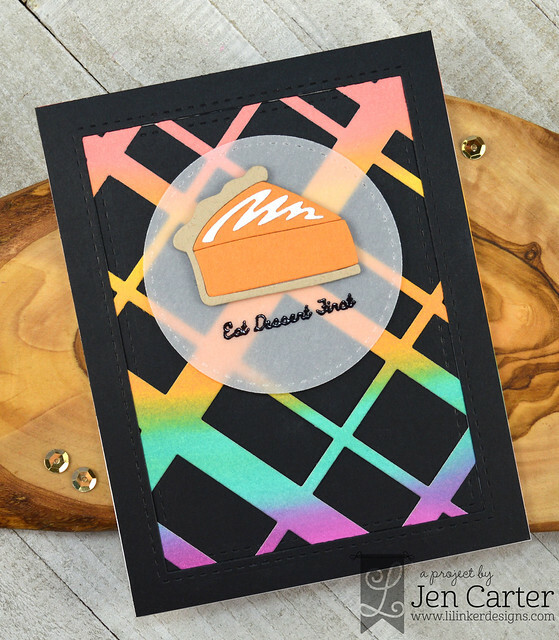 I have a few products left that I haven't yet shared from this release so today I'm going to share Blossoms & Banners Autumn stamps & dies, Hap-pie Thanksgiving Stamps, Pie Die Set & the must have Cover Up Die: Diagonal Plaid. For this first card I went pattern crazy. I cut one of the Anytime Tags 2 dies from black & white patterned paper. 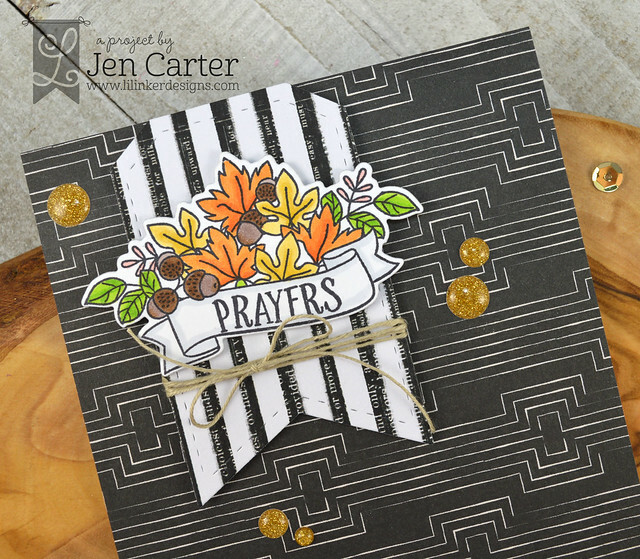 I then stamped the banner bouquet from the new Blossoms & Banners Autumn stamps & die cut it out with the coordinating Blossoms & Banners Autumn dies. The banner and flowers were colored with copics. To finish the card off I adhered the banner and florals with dimensional tape, added some twine and some gold enamel dots. I once went to a stamping conference and it was the night of the banquet. We were all dressed up and getting ready to eat. In walks the waiters with their trays held high and they were serving up giant slices of decadent chocolate cake...before the rest of the meal. We were eating our dessert first! It truly was a lot of fun! So I love the sentiment on this next card! I die cut a circle with the Stitched Mats: Dual Stitched Circles dies and then embossed the sentiment from Hap-pie Thanksgiving Stamps. 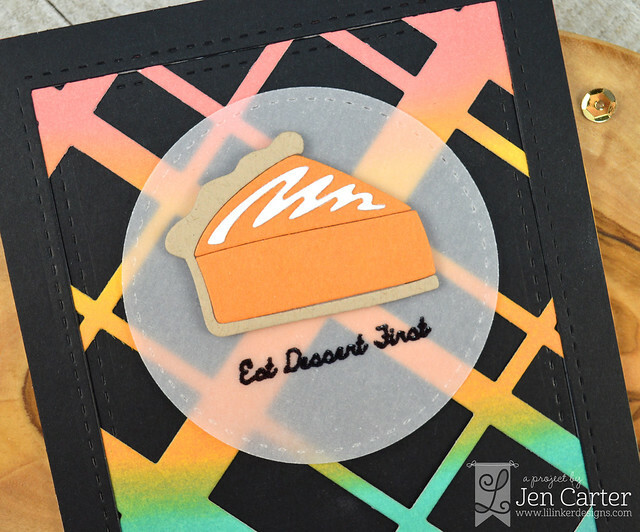 The pie, in pumpkin of course to celebrate Thanksgiving, was die cut with the new Pie Die Set and then adhered to the vellum circle with dimensional tape. All the Trimmings Catherine Pooler Release Day!